Despite profound discontent, the prospect of an exit from the neoliberal orthodoxies of the past 40 years terrifies even those who know how much they have suffered from it. The term “anti-systemic movements” was commonly used 25 years ago to characterize forces on the left in revolt against capitalism. Today, it has not lost relevance in the West, but its meaning has changed. The movements of revolt that have multiplied over the past decade no longer rebel against capitalism, but against neoliberalism—deregulated financial flows, privatized services, and escalating social inequality, that specific variant of the reign of capital set in place in Europe and America since the 1980s. The resultant economic and political order has been accepted all but indistinguishably by governments of the center-right and center-left, in accordance with the central tenet of la pensée unique, Margaret Thatcher’s dictum that “there is no alternative.” Two kinds of movement are now arrayed against this system; the established order stigmatizes them, whether from the right or left, as the menace of populism. It is not by chance that these movements first arose in Europe rather than the United States. Sixty years after the Treaty of Rome, the reason is clear. The common market of 1957, an outgrowth of the coal-and-steel community of the Schuman Plan (designed both to prevent any reversion to a century of Franco-German hostilities and to consolidate post-war economic growth in western Europe), was the product of a period of full employment and rising popular incomes, the entrenchment of representative democracy, and the development of welfare systems. Its commercial arrangements impinged very little on the sovereignty of the nation-states composing it, which were strengthened rather than weakened. Budgets and exchange rates were determined domestically, by parliaments accountable to national electorates, in which politically contrasting policies were vigorously debated. 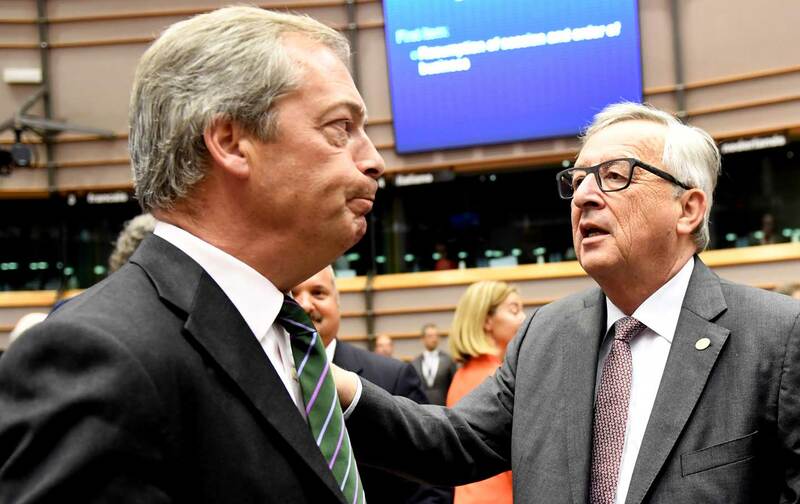 Attempts by the Commission in Brussels to aggrandize itself were famously rebuffed by Paris. Not only France under Charles de Gaulle but, in its own more muted fashion, West Germany under Konrad Adenauer, pursued foreign policies independent of the United States and capable of defying it. The end of the trente glorieuses brought a major change in this construction. From the mid-1970s, the advanced capitalist world entered a long downturn, as analyzed by the American historian Robert Brenner: lower growth rates and slower increases in productivity, decade by decade, less employment and greater inequality, punctuated by sharp recessions. From the 1980s, starting in the UK and the US, and gradually spreading to Europe, policy directions were reversed: Welfare systems were cut back, public industries and services privatized, and financial markets deregulated. Neoliberalism had arrived. In Europe, this came over time to take a uniquely rigid institutional form: The number of member states in what became the European Union multiplied more than fourfold, incorporating a vast low-wage zone in the East. From monetary union in 1990 to the Stability Pact in 1997, then the Single Market Act in 2011, the powers of national parliaments were voided in a supranational structure of bureaucratic authority shielded from popular will, just as the ultraliberal economist Friedrich Hayek had prophesied. With this machinery in place, draconian austerity could be imposed on helpless electorates, under the joint direction of the Commission and a reunified Germany, now the most powerful state in the union, where leading thinkers candidly announce its vocation as continental hegemon. Externally, over the same period, the EU and its members ceased to play any significant role in the world at variance with US directives, becoming the advance guard of neo–Cold War policies towards Russia set by the US and paid for by Europe. So it is no surprise that the ever more oligarchic cast of the EU, defying popular will in successive referendums and embedding budgetary diktats in constitutional law, should have generated so many movements of protest against it. What is the landscape of these forces? In the pre-enlargement core of the EU, the western Europe of the cold-war era (the topography of Eastern Europe is so different that it can be set aside for present purposes), movements of the right dominate opposition to the system in France (Front National), the Netherlands (Party for Freedom, PVV), Austria (Freedom Party of Austria), Sweden (Sweden Democrats), Denmark (Danish People’s Party), Finland (True Finns), Germany (Alternative for Germany, AfD) and Britain (UKIP). In Spain, Greece, and Ireland, movements of the left have predominated: Podemos, Syriza, and Sinn Fein. Uniquely, Italy has both a strong anti-systemic movement of the right in the Lega, and a still larger one across the left/right divide in the Five Star Movement (M5S). The latter’s extra-parliamentary rhetoric on taxes and immigration puts it to the right, but it is put on the left by its parliamentary record of consistent opposition to the neoliberal measures of Matteo Renzi’s government (particularly on education and deregulation of the labor market), and its central role in defeating Renzi’s bid to weaken Italy’s democratic constitution. To this can be added Momentum, which emerged in Britain behind Jeremy Corbyn’s unexpected election as Labour Party leader. All the movements of the right except the AfD predate the crash of 2008; some have histories going back to the 1970s or earlier. Syriza took off, and M5S, Podemos, and Momentum were born, as direct results of the global financial crisis. The central fact is the greater overall weight of movements of the right over those of the left, both in the number of countries where they have the upper hand and in voting strength. Both are reactions to the structure of the neoliberal system, which finds its starkest, most concentrated expression in today’s EU, with its order founded on the reduction and privatization of public services; the abrogation of democratic control and representation; and deregulation of the factors of production. All three are present at national level in Europe, as elsewhere, but they are of a higher degree of intensity at EU level, as the torture of Greece, trampling of referendums, and scale of human trafficking attest. In the political arena, they are the overriding issues of popular concern, driving protests against the system over austerity, sovereignty, and immigration. Anti-systemic movements are differentiated by the weight they attach to each—to which color in the neoliberal palette they direct most hostility. Movements of the right predominate over those of the left because from early on they made the immigration issue their own, playing on xenophobic and racist reactions to gain widespread support among the most vulnerable sectors of the population. With the exception of the movements in the Netherlands and Germany, which believe in economic liberalism, this is typically linked (in France, Denmark, Sweden, and Finland) not to denunciation but to defense of the welfare state; it is claimed that the arrival of immigrants undermines this. But it would be wrong to attribute all their advantage to this card; in important examples—the Front National (FN) in France is the most significant—they have an edge on other fronts too. Monetary union is the most obvious example. The single currency and central bank, designed at Maastricht, have made the imposition of austerity and denial of popular sovereignty into a single system. Movements of the left may attack these as vehemently as any movement of the right, if not more so. But the solutions they propose are less radical. On the right, the FN and the Lega have clear remedies to the strains of the single currency and immigration: exit the euro and stop the influx. On the left, with isolated exceptions, no such unambiguous demands have ever been made. At best, the substitutes are technical adjustments to the single currency, too complicated to have much popular purchase, and vague, embarrassed allusions to quotas; neither is as readily intelligible to voters as the straightforward propositions of the right. Immigration and monetary union create special difficulties for the left for historical reasons. The Treaty of Rome was founded on the promise of free movement of capital, commodities, and labor within a common European market. As long as the European Community was confined to countries of Western Europe, the factors of production where mobility mattered most were capital and commodities: Migration across borders within the community was generally quite modest. But by the late 1960s, immigrant labor from former African, Asian, and Caribbean colonies, and semi-colonial regions of the former Ottoman Empire, was already significant in numbers. EU enlargement to Eastern Europe then sharply increased intra-union migration. Finally, neo-imperial adventures in former Mediterranean colonies—the military blitz on Libya and proxy fanning of civil war in Syria—have driven large waves of refugees into Europe, along with retaliatory terror by militants from a region where the West remains camped as overlord, with its bases, bombers, and special forces. All of this has kindled xenophobia: Anti-systemic movements of the right have fed on it, and movements of the left have fought it, loyal to the cause of a humane internationalism. The same underlying attachments have led most of the left to resist any thought of ending monetary union, as a regression to a nationalism responsible for Europe’s past catastrophes. The ideal of European unity remains for them a cardinal value. But the present Europe of neoliberal integration is more coherent than any of the hesitant alternatives they have so far proposed. Austerity, oligarchy, and the ability to move factors of production form an interconnected system. Factor mobility cannot be separated from oligarchy: Historically, no European electorate was ever consulted about the arrival or scale of foreign labor; this always occurred behind its back. The negation of democracy, which became the structure of the EU, excluded from the start any say in the composition of its population. The rejection of this Europe by movements of the right is politically more consistent than rejection by the left, another reason for the right’s advantage. The arrival of M5S, Syriza, Podemos, and the AfD marked a jump in popular discontent in Europe. Polls now post record levels of voter disaffection with the EU. But, right or left, the electoral weight of anti-systemic movements remains limited. In the last European elections, the three most successful results for the right—UKIP, the FN, and the Danish People’s Party—were around 25 percent of the vote. In national elections, the average figure across Western Europe for all such right and left forces combined is about 15 percent. That percentage of the electorate poses little threat to the system; 25 percent can represent a headache, but the “populist danger” of media alarm remains to date very modest. The only cases where an anti-systemic movement has come to power, or looked as if it could do so, are those where a deliberate misapportioning of seats, through an electoral premium designed to favor the establishment, backfired, or risked doing so, as in Greece or Italy. In reality, there is a wide gap between the degree of popular disillusion with today’s neoliberal EU—by last summer, majorities in France and Spain expressed their aversion to it, and even in Germany, barely half of those polled had a positive opinion of it—and the extent of support for forces declaring against it. Indignation or disgust at what the EU has become is common, but for some time the fundamental determinant of European voting patterns has been, and remains, fear. The socio-economic status quo is widely detested. But it is regularly ratified at the polls with the reelection of parties responsible for it, because of fears that to upset the status, alarming markets, would bring worse misery. The single currency has not accelerated growth in Europe, and has inflicted acute hardship in the countries of the South worst affected. But the prospect of an exit terrifies even those who know by now how much they have suffered from it. Fear trumps anger. Hence the acquiescence of the Greek electorate in Syriza’s capitulation to Brussels, the setbacks of Podemos in Spain, the shuffling of feet by the Parti de Gauche in France. The underlying sense is everywhere the same. The system is bad. To affront it is to risk retribution. What, then, explains Brexit? Mass immigration is another fear across the EU, and it was whipped up in the UK by the Leave campaign, in which Nigel Farage was a conspicuous speaker and organizer, alongside prominent Conservatives. But xenophobia on its own is by no means enough to outweigh fear of economic meltdown. In England, as elsewhere, it has been growing as one government after another has lied about the scale of immigration. But if the referendum on the EU had just been a contest between these fears, as the political establishment sought to make it, Remain would have no doubt won by a handsome margin, as it did in the 2014 referendum on Scottish independence. There were further factors. After Maastricht, the British political class declined the straitjacket of the euro, only to pursue a native neoliberalism more drastic than any on the continent: first, the financialized hubris of New Labour, plunging Britain into a banking crisis before any other European country, then a Conservative-Liberal administration of an austerity more drastic than any generated without external constraint in Europe. Economically, the results of this combination are unique. No other European country has been so dramatically polarized by region, between a bubble-enclosed, high-income metropolis in London and the southeast, and an impoverished, deindustrialized north and northeast where voters felt they had little to lose in voting for Leave (crucially, a more abstract prospect than ditching the euro), whatever happened to the City and foreign investment. Fear counted for less than despair. Politically, too, no other European country has so blatantly rigged an electoral system: UKIP was the largest single British party at Strasbourg under proportional representation in 2014, yet a year later, with 13 percent of the vote, it gained just a single seat at Westminster, while the Scottish National Party, with under 5 percent of the vote, took 55 seats. Under the interchangeable Labour and Conservative regimes produced by this system, voters at the bottom of the income pyramid deserted the polls. But suddenly granted, for once, a real choice in a national referendum, they returned in force to deliver their verdict on the desolations of Tony Blair, Gordon Brown, and David Cameron. Finally, and decisively, came the historical difference separating Britain from the continent. For centuries, the country was not only an empire dwarfing any European rival culturally but, unlike France, Germany, Italy, or most the rest of the continent, did not suffer defeat, invasion, or occupation in either world war. So expropriation of local powers by a bureaucracy in Belgium was bound to grate more than elsewhere: Why should a state that twice saw off the might of Berlin submit to petty meddling from Brussels or Luxembourg? Issues of identity could more readily trump issues of interest than in the rest of the EU. So the normal formula—fear of economic retribution outweighs fear of alien immigration—failed to function, bent out of shape by a combination of economic despair and national amour-propre. These were also the conditions in which a US Republican presidential candidate of unprecedented background and temperament—abhorrent to mainstream bipartisan opinion, with no attempt to conform to accepted codes of civil or political conduct, and disliked by many of his actual voters—could appeal to enough disregarded white Rust Belt workers to win the election. As in Britain, desperation outweighed apprehension in deindustrialized proletarian regions. There too, much more rawly and openly, in a country with a deeper history of native racism, immigrants were denounced and barriers, physical as well as procedural, demanded. Above all, empire was not a distant memory of the past but a vivid attribute of the present and natural claim on the future, yet it had been cast aside by those in power in the name of a globalization that meant ruin for ordinary people and humiliation for their country. Donald Trump’s slogan was “Make America Great Again”—prosperous in discarding the fetishes of free movement of goods and labor, and victorious in ignoring the trammels and pieties of multilateralism: He was not wrong to proclaim that his triumph was Brexit writ large. It was a much more spectacular revolt, since it was not confined to a single—mostly symbolic—issue, and was devoid of any establishment respectability or editorial blessing. Trump’s victory has thrown the European political class, center-right and center-left united, into outraged dismay. Breaking established conventions on immigration is bad enough. The EU may have had few scruples in penning refugees into Recep Tayyip Erdoğan’s Turkey, with its tens of thousands of political prisoners, police torture, and suspension of what passes for the rule of law; or in winking at barbed-wire barricades across Greece’s northern frontier to keep them locked up on Aegean Islands. But the EU, respecting diplomatic decencies, has never openly gloried in its exclusions. Trump’s lack of inhibition in these matters does not directly affect the union. What does, and is cause for far more serious concern, is his rejection of the ideology of free movement of the factors of production, and, even more so, his apparently cavalier disregard for NATO and his comments about a less belligerent attitude to Russia. Whether either of these is more than a gesture soon to be forgotten, like many of his domestic promises, remains to be seen. But his election has crystallized a significant difference between a number of anti-systemic movements of the right or ambiguous center, and parties of the established left, pink or green. In France and Italy, movements of the right have consistently opposed neo–Cold War policies and military adventures applauded by the parties of the left, including the blitz on Libya and sanctions on Russia. The British referendum and the US election were anti-systemic convulsions of the right, though flanked by anti-systemic upsurges of the left (the Bernie Sanders movement in the US and the Corbyn phenomenon in the UK), smaller in scale, if still less expected. What the consequences of Trump or Brexit will be remain indeterminate, though no doubt more limited than current predictions. The established order is far from beaten in either country, and, as Greece has shown, is capable of absorbing and neutralizing revolts from whatever direction with impressive speed. Among the antibodies it has already generated are yuppie simulacra of populist breakthroughs (Albert Rivera in Spain, Emmanuel Macron in France), inveighing against the deadlocks and corruptions of the present, and promising a cleaner and more dynamic politics of the future, beyond the decaying parties. For anti-systemic movements of the left in Europe, the lesson of recent years is clear. If they are not to go on being outpaced by movements of the right, they cannot afford to be less radical in attacking the system, and must be more coherent in their opposition to it. That means facing the probability that the EU is now so path-dependent as a neoliberal construction that reform of it is no longer seriously conceivable. It would have to be undone before anything better could be built, either by breaking out of the current EU, or by reconstructing Europe on another foundation, committing Maastricht to the flames. Unless there is a further, deeper economic crisis, there is little likelihood of either.